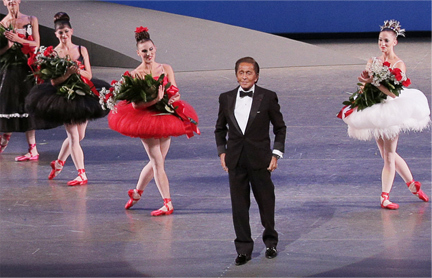 Fusing two of his loves, dance and fashion, Valentino recently painted the town red with an opening night to remember. When Valentino Garavani officially stepped down from designing his haute couture collection in 2008 everyone bid farewell to his eponymous ladies in red. As one of the last great couturiers from an era when fashion meant sophistication and elegance, his legendary designs have dressed the world’s chicest women, from Sophia Loren and Grace Kelly to Jackie Onassis and more recently, Gwyneth Paltrow. But adieus aren’t forever and on September 20th 2012, amidst a star-studded audience at the Lincoln Center in New York, Valentino watched the curtain rise once more on his creations. Only this time the catwalk had been replaced by a stage, the models had become ballet dancers and the occasion was the NYC Ballet’s 2012 Fall Gala. Featuring a world premiere ballet and rare pieces from the company’s repertoire, this one-time only special performance was the ideal backdrop for a unique collaboration. A fervent ballet fan – his business partner, Giancarlo Giammetti is a NYCB board member alongside Sarah Jessica Parker – Valentino has long been a regular on the red carpet at the New York City Ballet’s opening night. So when he was invited to design the costumes for this exclusive evening, he accepted with pleasure. This isn’t Valentino’s first foray into creating costumes for ballet, having already worked with the Vienna Ballet in 2009. But this time was special. 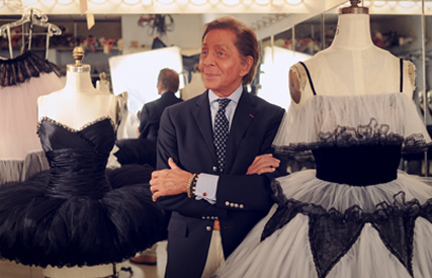 Shuttling between Italy and New York, working with American seamstresses, Valentino created the costumes for three ballets choreographed by his longtime friend, NYC Ballet Master in Chief, Peter Martins. Peter Martins’ program included selections from Tchaikovsky’s Eugene Onegin as well as two rarely seen pieces d’occasion that had been especially devised for the 1988 American Music Festival; Sophisticated Lady, complete with a musical score by Duke Ellington and Not My Girl, a pas de deux inspired by and set to the music of Fred Astaire. In costume terms there were plenty of references to Valentino’s own catwalk days. Scarlet petticoats fluttered beneath monochrome chiffon and organza tea-length dresses while bubble shaped tutus twirled across the stage in red and white. Even the satin ballet shoes were crimson. Male members of the corps were effortlessly chic in black suits with ties and white shirts. As the evening continued the New York City Ballet paid a special tribute to the designer himself and his famed ‘Valentino Red’, by performing George Balanchine’s Rubies. It was set to Igor Stravinsky’s Capriccio for Piano and Orchestra with costumes by Karinska and scenery by Peter Harvey. Celebrations carried on well into the night with a black-tie dinner and ball for over a thousand guests, who later joined the New York City Ballet members on the dance floor.